A New Year's Open House is an old fashioned way to entertain that's easy on the host and hostess. This fluid party is best served by an appetizer and dessert buffet; all you have to do is occasionally replace and replenish the food and make sure the coffee is hot and fresh. Send your invitations by email or telephone; tell everyone that the hours for the open house will be from noon to four or five o'clock in the afternoon. People come and go to this party, and the ebb and flow of guests make it interesting and lively. Did you know that there are certain foods that many cultures consider good luck charms if eaten on New Year's Day? Southerners eat black eyed peas and cornbread for luck and wealth. The ancient Romans served dates, nuts, and raisins. Dutch people consider food shaped in a ring to be good luck; the shape is symbolic of a completed year. Dark greens like kale and spinach mean wealth will come to you; these foods can be folded like money. Fish is a good luck charm. And the Italians eat sweets at this holiday for good fortune throughout the new year. I've included recipes for your buffet that use these foods in delicious and easy ways. Remember, for safety's sake, to completely remove and replace perishable foods (meat and dairy, mostly) after they have been at room temperature for two hours. That means that you'll need to replace the food once during your party. Have extra trays of food prepared and stored in the fridge or freezer so you can make sure everyone stays safe. Enjoy your party! This delicious punch is made ahead of time and stored in your freezer. Divide it into two batches so you can easily replenish the punch halfway through your party. Black eyed peas make their appearance in this easy and delicious dip that you serve with tortilla chips or toasted slices of crunchy baguettes. Red bell peppers add color and great taste to this easy and creamy crockpot recipe. I like to stir in a drained can of crabmeat for a special touch. This pizza is a great way to eat fish for a good luck charm. The creamy melted cheeses are a perfect complement to the smooth, delicate fish. This simple appetizer recipe is so good. 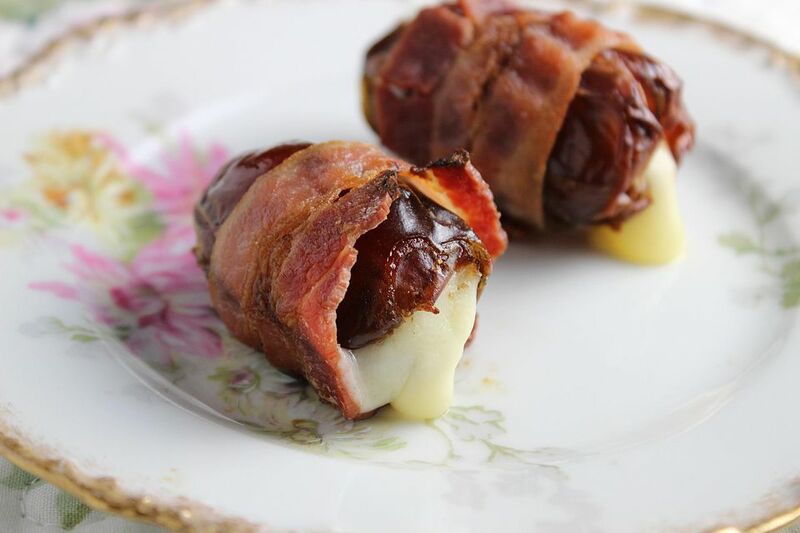 The combination of salty bacon, sweet dates, and savory cheese is unbeatable. Use a second crockpot to keep these delicious little meatballs warm in their mouth-watering sauce. Your guests will love this recipe! A flashback to the 1980s! I love this beautiful and colorful dip with its perfect combination of textures and flavors. Make several different types of these fabulous little quiches and store them in your freezer, then reheat in batches during the party. This old family recipe is a must for the holidays. Dates and nuts are mixed with peanut butter and sugar, then encased in smooth chocolate for a great homemade candy. Candied fruit fills this delicate thin cookie; it tastes almost like candy. This is one of those magic recipes that tastes like so much more than the sum of its ingredients. It's crispy, sweet, chocolatey, and just plain wonderful.